Both medications have unwanted side-effects. Merida can cause hypertension and irregular heartbeat. Xenical can cause diarrhea and osteoporosis. Auricular acupuncture to lose weight is the key.I chose the points of hunger and mouth which are the most efficient points for deceasing the appetite. The rest of points are spleen, stomach, liver, small intestine, endocrine system and Sheng Meng (known as “Spirit gate”). These points can inhibit stomach activity, slow the absorption of nutrition from food in the stomach and small intestine, improve energy and decrease stress, anxiety and depression. Patients should press the ear needles to ease their craving for food when she/he feels hungry. 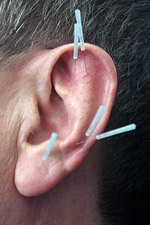 I will use ear seeds (herbal seeds or magnet seeds) in place of needles for those who fear needles. Generally speaking, they have the same effect. If you are overweight, obese or have weight issues and would like to lose weight, please call me at (212) 779-0468 or e-mail me to set up a consultation.